Bob Knight joined ESPN in February 2008 as one of the network's high profile hires at the analyst position. Knight was given a leading role in the college basketball studio and even his own SportsCenter segments watching and analyzing film. He even got to wear matching sweaters with Brent Musburger on game telecasts. Since that time though, Knight's presence on ESPN airwaves has dissapated to the point there were reports last year that he was mainly kept to Thursday night SEC games with Rece Davis as well as a few studio appearances. All indications were that ESPN was going to quietly let Knight go at the end of last season without renewing his contract. Knight's name appeared in the announcing assignments for the 2013-2014 college basketball season alongside Rece Davis once again for Thursday night SEC games. We can report that ESPN has indeed re-signed The General to a new contract. Terms were not disclosed. Along with his work with Davis, Knight will appear in the studio occasionally, although not on a regular basis. 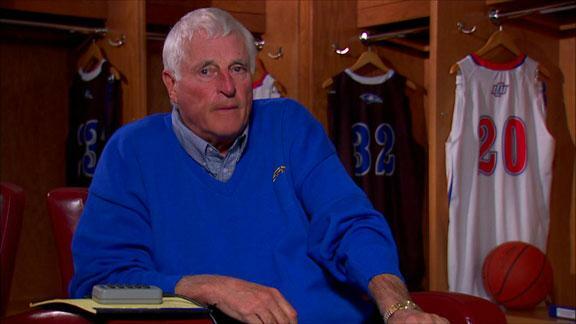 What do you think about Bob Knight's return to the broadcast booth and his tenure at ESPN? Is there any way he becomes a larger presence at the network once again? Leave your thoughts in the comments below.